Enjoying the view at Cape Three Points. Boats and buildings on Kokrobite beach. 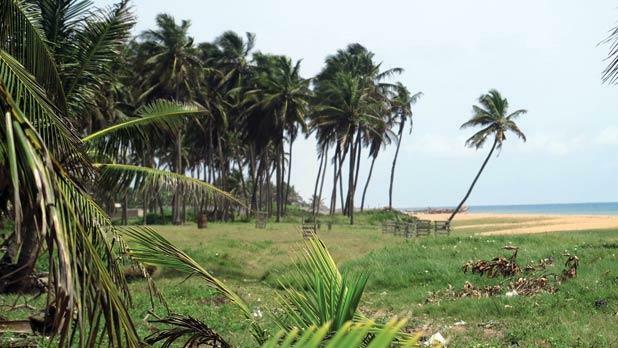 Deserted stretches of Ghana’ s west coast. Beach camp accommodation on the coast. A multicultural community near Jamestown. Eager to learn the techniques of surfing, but wishing to avoid the mockery of the ultra-cool elite, Stephen Bailey heads to the isolated shores of West Africa. 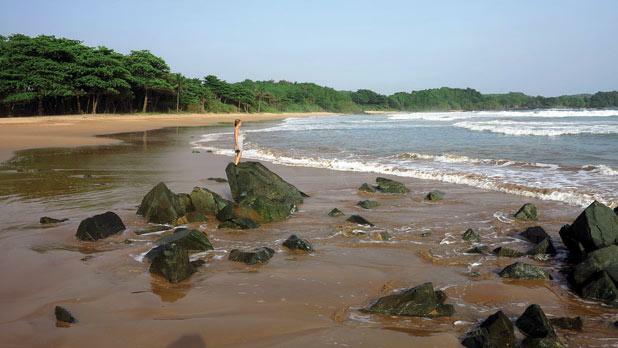 On Ghana’s West Coast, the waves curl like a magician’s fingers. Atlantic Ocean rollers rip across bays fringed by thick green forests. White sand stretches out deserted, apart for the odd wooden shack that smells of barbecued goat skewers. Guesthouses are built with palm fronds as walls and the sand as the floor. It’s a coastline of promise, one screened to the world in the 1960s surf movie Endless Summer and fringed by seemingly perfect surfer’s waves. Yet there’s not a single surfboard in sight. First, a confession. I can’t actually surf. Trying to learn at a world-famous rip was horrendous. Clumsily falling off a board while a few dozen muscled surfers laugh at the amateurism isn’t fun. You’re just not cool if you’re getting wiped out by waves every few seconds. That’s why I’m in Ghana, a country where most people have never even heard of surfing. I land in Accra, the capital city throttled beneath exhaust fumes and stereos blasting dancehall music. It catapults me straight into the madness of West Africa: tropical rains devouring the streets, children stroking my arm hair in astonishment, whiffs of sewage mingling with rotting fish. The central beach is lost beneath a mountain of plastic and human excrement. No surfing here. Yet there is an undeniable welcome epitomised by the coastal community beneath Jamestown. Hundreds of different tribes have become neighbours here, most of them refugees fleeing persecution. Chad, Niger, Congo, Somalia, Central African Republic, each nation is all smiles as I wander past fishing nets and the remains of English and Danish colonial castles. Following the Atlantic coastline I head west, bumping along atrocious roads that fling dust into grilled house windows. Beneath the reggae bars of Kokrobite, two local men are surfing, carving through the waves as local women sit fully clothed in the shallows. Palm trees tower over the sand and a band is rehearsing UB40 numbers. Tribal tradition dictates that Ghanaians are named after the day they are born, which provides seven different names, albeit in more than 80 different tribal languages. To avoid confusion, the locals have a tendency to give themselves English names. I’d already met a Patience, Perfect, and a Nice, so I was expecting Mr Bright to be another idealistic name change. Local children join me in the water, surfing on homemade wooden planks with unfathomable dexterity. How do they not get splinters? However, Mr Bright is an English surfer called Brett. The locals struggled to pronounce Brett, so the name Bright stuck. “When I first arrived in Ghana I just saw waves. Every time I surfed there would be 10 locals asking to try,” he said. My lessons aren’t free but it’s difficult to argue with €10 for two hours of private tuition. I paddle out to the bubbling backbeat of reggae numbers. First wave, crash. Second wave, crash. At some point I briefly stand before being deposited into the ocean, but it’s a small victory in a battle against the Atlantic. Exhausted, bruised, embarrassed, I return to the beach only to be surrounded by local women wanting a selfie with the ‘surfer’. Ability is clearly unimportant. You only need to hold a board to join the cool club in Ghana. 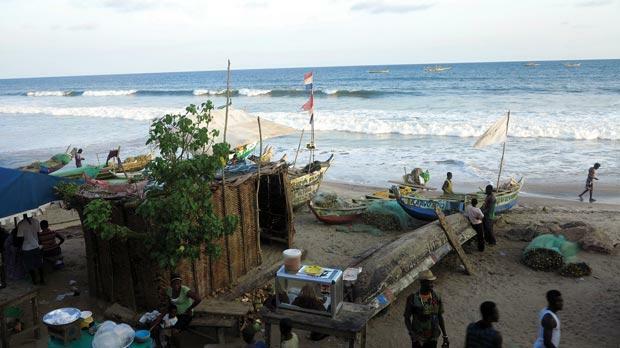 Another two hours’ west, Cape Coast reveals a coastline of persecution. Ghana was at the heart of the slave trade and tens of millions were exported through a ‘door of no return’. Blacked-out dungeons and chains fill the Cape Coast Castle, the mud beneath my feet a four-century-old mix of human faeces and burnt dead bodies. Nearby Elmina Castle is equally eerie, the souls of the stolen filling decrepit rooms of dank smells. While the guide’s narratives are haunting they always come with dark humour, especially concerning how the English and Portuguese built churches directly above slave cells. The landscapes are dominated by green as I continue the journey westward. A thousand shades shimmer across the landscape, thick awnings of forest standing above long stretches of deserted sand. It’s here, in Busua, that I gaze out at the seemingly perfect surfer wave. Apparently, foreigners have been coming here since the 1960s. But there’s little sign of development, other than a couple of whitewashed hotels on the beach. Beer costs €1 a bottle, a fresh barbecued lobster sets me back €8 and surf board hire comes to less than €5 a day. So where are all the surfers? For two days I practise in the waves, honing my skills until standing up is a firm possibility, if not quite a probability. Children join me, surfing on homemade wooden planks with unfathomable dexterity. How do they not get splinters? One child finishes and another grabs the wood, running in with shrills of delight. After three days the locals come. Half a dozen pull out tricks on the right-hand breaks, their tiny, second-hand boards covered in masking tape and cracks. They’re good, and they invite me out to the back line. I decline, preferring the beginner’s white foam. Back on the sand, it’s not beer that’s passed around. A teenage child cracks open fresh coconuts and sweet water re-energises bodies for another session. “We were surfing at Cape Three Points,” one says. It’s barely 20 miles away but they can only afford to go when a foreigner joins them and pays the transport costs. 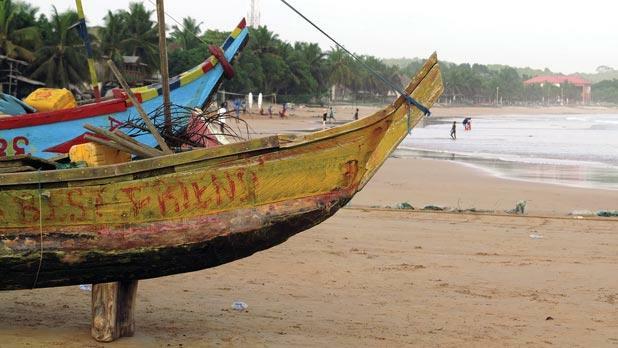 Ghana’s embryonic surf culture isn’t well funded or supported. The boards are all donations but two surf schools have emerged on Busua’s beach, trading out of wooden shacks draped in red, yellow and green. One is the headquarters of the West Africa Surf Association, a charity that gathers used equipment and hands it over to talented youngsters. One of a new breed of local instructors is my next guide and after two more days I feel confident enough to say I can surf. Well, surf in a straight line, that is. In such a blossoming culture there’s constant shouts of encouragement among the crowd. Merely standing on the board gets ripples of applause. Ten of us pack into a decaying minivan and crawl over the potholes to Cape Three Points. A single palm tree separates two pristine white sand bays, each evoking eternal impressions of beach escapism. A crashing right-hand break rolls across the bay, starting beside an old lighthouse on the cliff and curving elegantly. Cape Three Points is hardly even a village, just a few weather-beaten shacks hidden between the trees. There’s only one place to stay, an eco-lodge with drainpipes made from recycled plastic bottles and tree houses constructed from mismatched timber. Fishermen’s canoes join the surfers but the wave is far too big for my infantile skills. I crash, crash again and leave it to the others. A week may not be long enough to learn how to really surf, but it’s made me feel part of something. Surfing’s cool elitism doesn’t exist here. 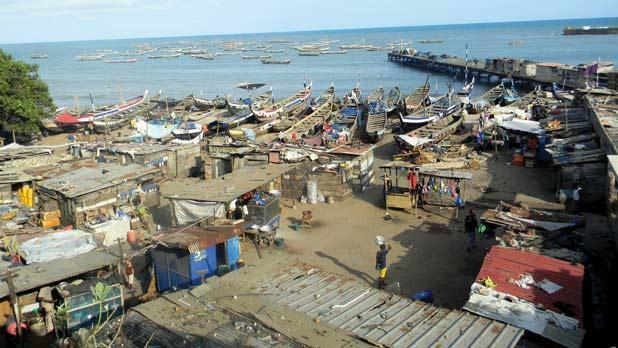 Along the length of Ghana’s West Coast, the rugged charms of Africa are mingling with vibrant optimism. 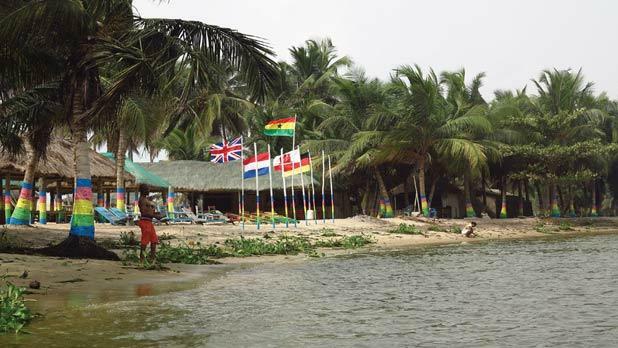 And while surfers all over the world complain of overcrowded waves and over-commercialised destinations, Ghana is taking it all back to basics.